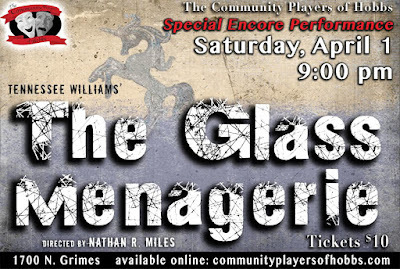 The Community Players of Hobbs: Reminder, ENCORE PERFORMANCE of "The Glass Menagerie"
Reminder, ENCORE PERFORMANCE of "The Glass Menagerie"
"The Glass Menagerie" also won awards for Best Costume Design, Best Ensemble Performance, and Best Actress in a Supporting Role (Sarah Bunch as "Laura Wingfield"). 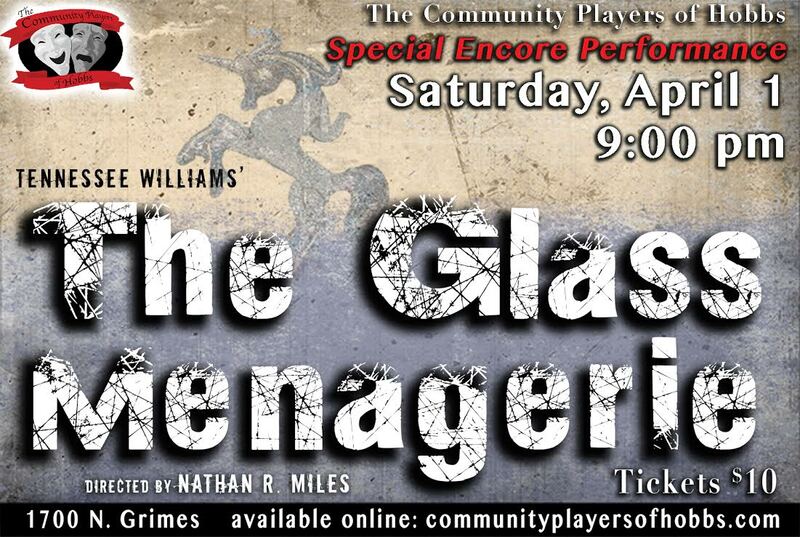 This outstanding show will have an encore performance on Saturday, April 1 at 9 PM (no April Fooling!!). Tickets are available online or at the door (click the ticket icon on the left to get your tickets online). Don't miss this ONE NIGHT ONLY encore show! !